I love it when the Upscale Swap Group cards arrive! I had the privilege of being the hostess last month, so all of the cards came to ME! Once I had everyone's cards, then it was time to sort them. 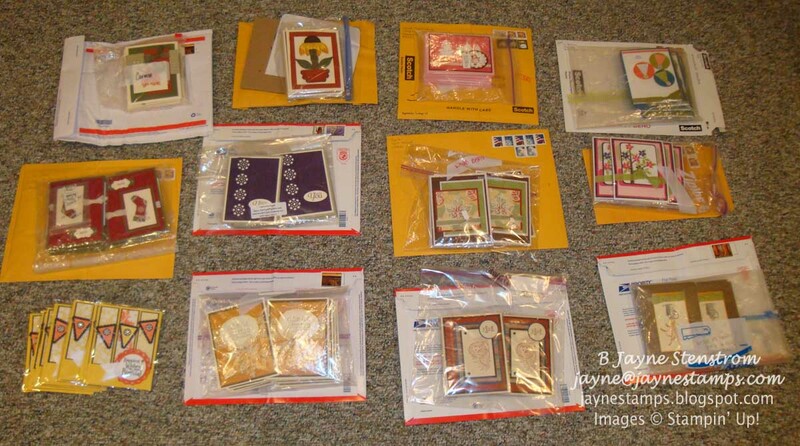 Here's a look at the cards before I started sorting. It's not too bad since we keep the number of swap cards each month to 12. 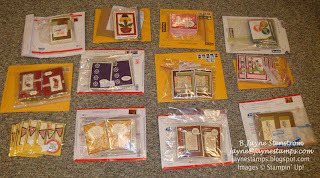 Today I wanted to show you a few of the cards from this month's swap that were made using the Gently Falling stamp set. This set is a new one in the 2011 Holiday Mini Catalog. I love leaf stamps and I immediately fell in love with this set when I first saw it. 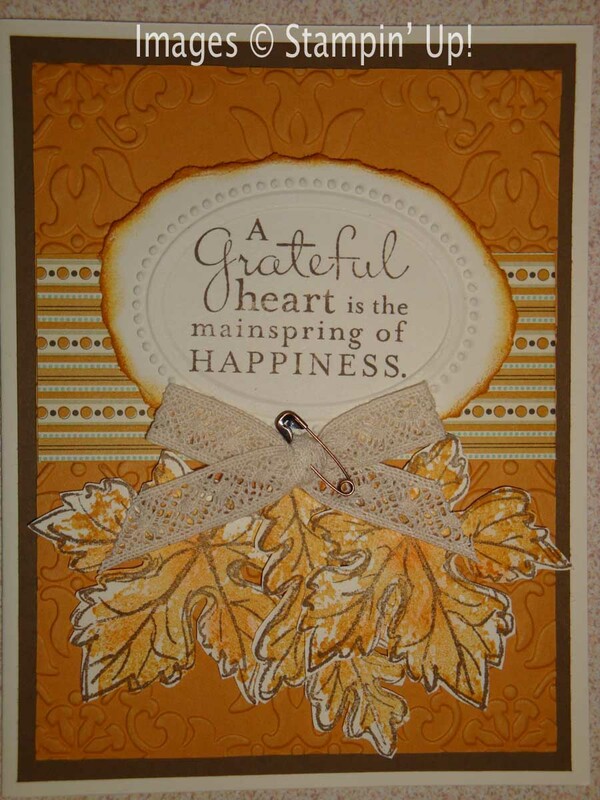 Laura Barto created the first card sample. Besides the Gently Falling stamp set, she used two Embossing Folders - Square Lattice and Houndstooth. This card has such great texture to it! Next card was created by Carmen Ramirez. Her leaves have a shimmer to them, which was created by applying Champagne Mist Shimmer Paint on them. You can see a little bit of it in the picture. Judi Cayton made this last card. 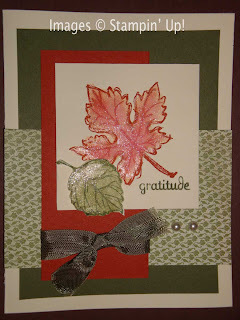 I love the colors and textures in this card. 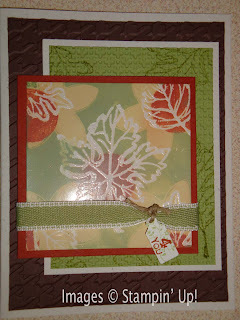 She used the Vintage Wallpaper and the Designer Frames Embossing Folders. I especially like the Chantilly Crochet Trim tied in a bow with a Vintage Trinket safety pin through it. It adds such a nice touch, don't you think? Our weather has is cooling down considerably today and tonight, so it's got me feeling "fall-ish". I love fall - especially the gorgeous colors that come out on the trees! Now I know that we'll probably have some more warm days, but I can tell by the feel in the air that summer is gone. 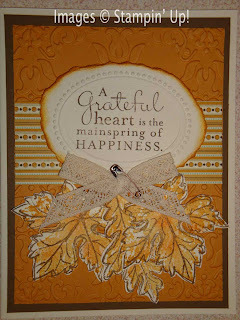 This is a great time of year to get stamping and scrapping again. Let me know what you like best about fall and what kind of things you're creating. I'd love to hear from you!